The Ell-Saline Cardinal football squad saw its season come to a heartbreaking end Friday night, falling in defeat in the Regional round of the Class 1-A playoffs on the road against the Plainville Cardinals 31-28. In a nip and tuck affair in which neither team led by more than seven points throughout, Plainville (8-2) struck the first blow, opening the game with an eight-play, 66-yard drive, capped off by a short touchdown run by talented junior tailback Jared Casey. Late in the first quarter, Ell-Saline (7-3) answered with a lengthy drive of its own, marching 72 yards on ten plays, with senior quarterback Nick Davenport scoring on a six-yard touchdown run to draw Ell-Saline even at 7-7. All three turnovers in the matchup occurred during the final two minutes of the first quarter. On the first play following a fumble by Plainville’s junior quarterback Jordan Finnesy, Davenport threw his lone interception of the night, getting picked off at the goal line. Two plays later, Plainville junior Cody Crawford fumbled inside the 10-yard line. Ell-Saline junior Luke Parks scooped the pigskin and lunged across the goal line to give Ell-Saline a 14-7 lead with 32 seconds remaining in the opening stanza. Plainville answered back with 8:03 to play in the second quarter as Casey tallied his second touchdown run of the night, this time from 15 yards out to tie the ballgame at 14-14. Late in the first half, Finnesy was sacked on third and long, then spiked the football in frustration, drawing a personal foul penalty. The markoff would prove costly. Following a punt, Ell-Saline took over at the Plainville 44-yard line. Eight plays later, Davenport found the end zone again, scoring on a four-yard run with 33 seconds to play before halftime, giving Ell-Saline a 21-14 lead going into the locker room. The pivotal swing in the game came at the beginning of the second half. 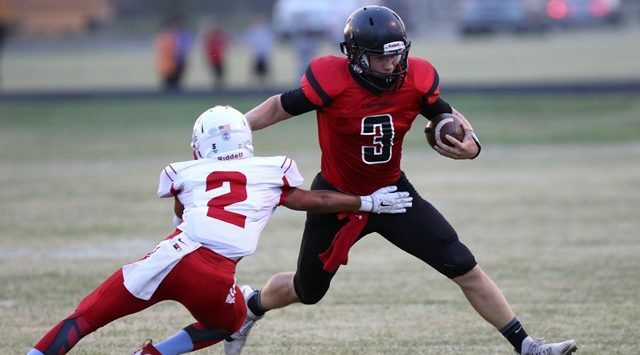 Ell-Saline received the kickoff with an opportunity to put a little breathing room between itself and Plainville with a score, but the host Cardinals rose to the challenge. After forcing a punt, Plainville took over and proceeded to steamroll 66 yards on eight plays, with Finnesy finishing off the scoring drive on a four-yard touchdown run to tie the game at 21-21 with 6:58 remaining in the third quarter. Plainville would then force another punt before putting together its longest drive of the night – a 10-play, 58 yard drive that ended in another Finnesy four-yard touchdown run to give Plainville a 28-21 lead with 22 seconds to play in the third quarter. Late in the fourth quarter, Ell-Saline drew even on its longest drive of the night, rumbling 75 yards on 11 plays with Davenport turning the hat trick with his third touchdown run of the night, this time from seven yards out to again draw Ell-Saline even at 28-28 with 3:29 to play. Plainville took over for its final drive of the night from its own 27-yard line. Finnesy and Casey then combined for nine-consecutive rushing plays, driving down to the Ell-Saline 20-yard line before calling on senior place kicker Tanner Copeland. With the ball spotted between the hashes, Copeland drilled a 37-yard field goal with just four seconds remaining in the contest. Ell-Saline had one final play from its own 10-yard-line, but Davenport’s final pass as an Ell-Saline Cardinal fell incomplete as time expired, giving Plainville a thrilling 31-28 victory. Ell-Saline finished the night with 309 total yards of offense, with Davenport going 16-for-30 through the air for 211 yards and one interception. Junior receiver Sawyer Kramer led the Cardinal receiving corps with seven catches for 114 yards before leaving the game in the third quarter with a knee injury. On the ground, Ell-Saline rushed 27 times for 98 yards. Davenport led the ground attack with 47 yards and three touchdowns on 16 carries, with junior tailback Luke Parks adding 35 yards on seven attempts.